This Problem Article explains the NiceLabel problem that occurs when changing an IP address on a printer causes NiceLabel to consume additional printer against the license. NiceLabel manages printer counts against a license by looking at the printers listed in Windows Printers & scanners. With multiple workstations, NiceLabel looks at ALL the printers on ALL the workstations. If print queues, listed in Windows Printers & scanners (across all workstations) reference the same driver name with the same IP address, NiceLabel counts this as ONE printer (not two). NiceLabel also retains printer information for a unique print queue for one week. If the print queue is not used and the printer is not set to reserved, the printer will drop off the Licensed Printers list. 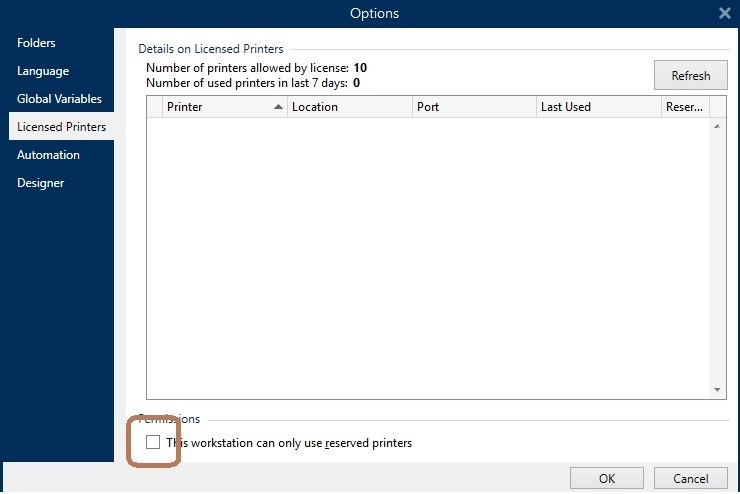 Uncheck the box for both new and old printers in the NiceLabel License Printers list. More information about NiceLabel licensing at this link.